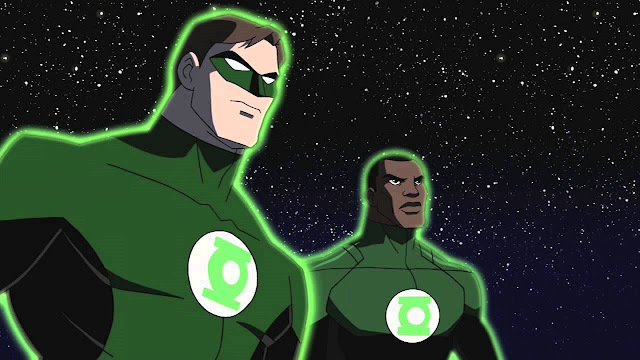 Get ready for some intergalactic action when Hal Jordan and John Stewart team up for WB/DC's Green Lantern Corps. The studio is finally moving ahead on the project with David Goyer producing and writing the script with Justin Rhodes. It's being described as "Lethal Weapon in space" featuring DC Comics' first African-American superhero in Stewart. The story is origin-based and comes from Goyer and fellow producer Geoff Johns. It'll focus on Jordan and Stewart amid the larger Corps of galactic protectors. Green Lantern Corps would usher in a new wing of the DC universe in a similar way that Guardians of the Galaxy did for the MCU. An intergalactic police force opens up new stories full of aliens and different worlds. Unlikely to reprise his role as Hal Jordan/Green Lantern from the panned misfire of the 2011 'Green Lantern' film is Ryan Reynolds who is still riding high from his leading role success in the hit 'Deadpool' movie. Instead, fans will inundate the internet with their choices for possible characters like Kyle Rayner, Guy Gardner, Jessica Cruz, Alan Scott, and Simon Baz. Bradley Cooper's name always pops up in regards to the Hal Jordan role. At least one actor is throwing his hat in the ring for John Stewart. It's not actor/singer Tyrese, who's openly campaigned for the role in the past, but one of the hottest actors on television. Emmy-winner Sterling K. Brown (The People vs O.J. 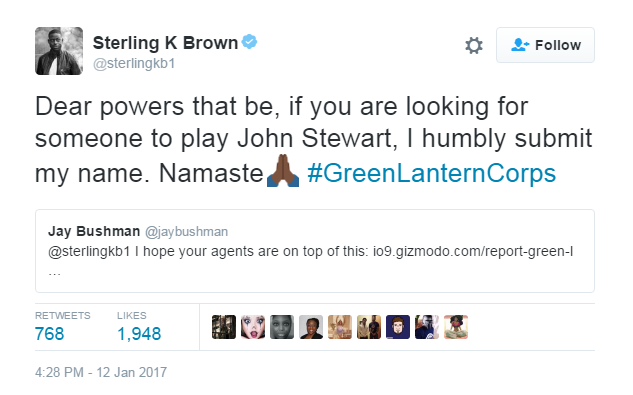 Simpson, This is Us), when alerted to the casting opportunity, replied with an agreeable tweet, "Dear powers that be, if you are looking for someone to play John Stewart, I humbly submit my name. Namaste. Brown would be a perfect fit but he just booked a role in Marvel's upcoming 'Black Panther' film starring Chadwick Boseman. It wouldn't be the first time an actor moved between DC/Marvel films though. Reynolds famously did it, so has Adewale Akinnuoye-Agbaje (Thor: The Dark World, Suicide Squad), and Callan Mulvey (Batman v Superman, Captain America: The Winter Soldier) to name a few. Goyer has done extensive screenwriting and producing with comic book films like Chris Nolan's Dark Knight trilogy, Man of Steel, Blade, Ghost Rider, and Batman V Superman. The lesser known Rhodes has done script work for the upcoming Guillermo del Toro-directed Fantastic Voyage remake. What Green Lantern Corps characters are you looking forward to seeing in the film and who would you want to see in those roles? David Goyer DC Comics Geoff Johns Green Lantern Green Lantern Corps Hal Jordan John Stewart movie Sterling K. Brown Warner Bros.
Labels: David Goyer DC Comics Geoff Johns Green Lantern Green Lantern Corps Hal Jordan John Stewart movie Sterling K. Brown Warner Bros.